HAMBURG – December 7, 2016 - Distribution network operator Stromnetz Hamburg GmbH contracted GE Energy Connections (NYSE: GE) with the modernization of its substation Hamburg Mitte in spring 2016. The substation, located in the city center of Hamburg, is regarded as the heart of the downtown power supply network. As part of the contract, GE is responsible for the electro-technical planning, the delivery, installation and commissioning of two transformers and one gas-insulated switchgear (GIS). The facility is scheduled to be handed over as a turnkey project to Stromnetz Hamburg GmbH in fall 2018. With the delivery of the two 63 MVA transformers from the GE plant in Mönchengladbach, Germany, the first milestone of the project has now been completed. The power transformers filled with oil weigh 77 tons each and were transported by road from Mönchengladbach to Hamburg. The location of the substation required precise planning of the construction works to minimize the effect on residents and shop owners during the construction period. 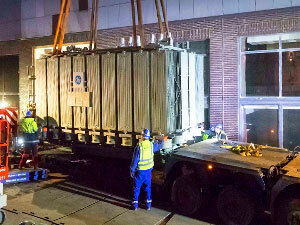 The last stage of the transformer delivery in the city center was carried out at night in order not to interfere with the inner-city Christmas markets in Hamburg. The modernization entails the construction of a new building inside the existing substation, while the availability of the old facility will be maintained to guarantee supply reliability. The old facility will be dismantled once the new substation is handed over to the customer. "The Hamburg Mitte substation is one of our oldest facilities and as such not very recognizable for most of the inhabitants of Hamburg. We undertake substantial investment efforts to maintain our facilities in a secure and discreet state within the city scape. With GE, we have an experienced industrial company - also on this construction site - which is familiar with our plants and supports us to adhere with the tight deadlines" explains Thomas Volk, Technical Director at Stromnetz Hamburg GmbH. "We are happy to continue the positive cooperation with Stromnetz Hamburg GmbH following the completion of the modernization of Jenfeld substation and while actively working on the modernization of the Hamburg West substation. Our technology will provide the facility with the necessary flexibility to be able to react to the requirements of the energy transition," says Axel Kossmann, Account Sales Director, Grid Solutions GmbH from GE Energy Connections in Berlin.